Milking this for all it’s worth | I'm Gonna Cook That! After a week off from blogging to wrap up Finals at school, I now have a week off of school so I can get back to blogging. Synchronicity? Or something. There’s a word for it. Anyhoots, I’ve actually missed writing and I’m glad to be back to business. I’ve decided it’s long past time for me to get started on that culinary bucket list. One of the items on the list was to start making my own almond milk. So… for the past couple months I’ve been buying up almonds and I now have quite the little herd and I go outside and milk them every– not buying it, are you? Fine. I went and bought some almonds. Happy? Seriously, though, I’m actually kind of embarrassed about how long it took me to tackle this particular item because it’s so freaking easy. I used about 8 ounces of almonds, which got me about a pint of almond milk. I made the switch from cows milk to almond milk about three years ago, but one of my biggest pet peeves about buying it is that I don’t use it all before it goes bad. If you’re a regular drinker of almond milk, you know how long it takes for that to happen, but for some reason I just forget about it. I’m not a regular cereal eater, so unless I’m on one of my smoothie kicks, I really don’t use it all that much. It’s just one of those things I feel like I need to have around. Now that I know how to make my own, and make only enough for what I actually need for a couple days, I can cut the cord and stop relying on the stuff from the grocery store. 1. 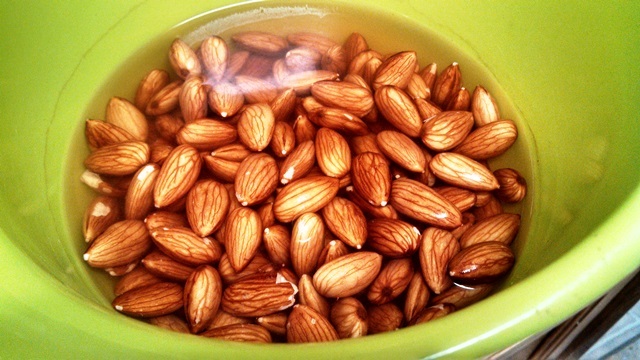 Soak your almonds in water at least overnight, or for as long as two days. The water should just cover the almonds. As they soak, they’ll absorb the water and get bigger and plumper. All the recipes I’ve read said the almond milk will be creamier the longer the almonds soak, so if that’s important to you remember that you’ll need a two day head start before you can actually make the milk. 2. 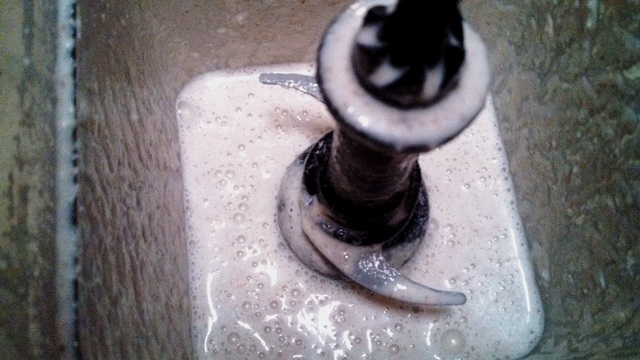 After they’ve soaked, you can just dump the whole she-bang, water and all, into your blender. Some recipes say to drain the almonds and start over with fresh water. I’m not sure why. I’ll try it that way next time and see if it makes a difference. 3. Pulse the blender a couple of times to break up the nuts a little, and then blend the water and almonds on high for a couple of minutes. The almonds should be pretty much pulverized, and the liquid should be… well… milky. If it looks a little too thick, you can add more water. I think I added about 1/3 of a cup. 4. 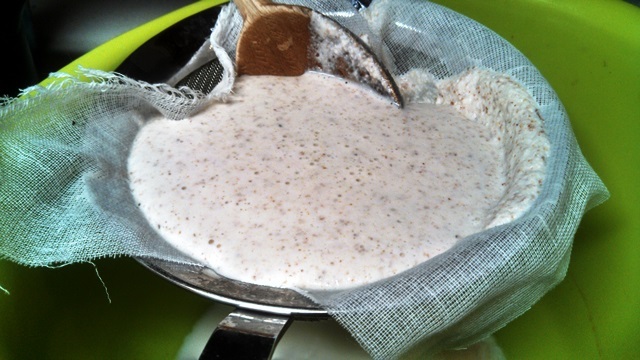 Line the fine mesh strainer with a pretty large square of cheese cloth, and then strain the liquid from the almond meal a little bit at a time. You can stir it with your spoon to get most of the liquid through, and then gather up the corners of the cheesecloth and squeeze the rest of the liquid out by hand. Just repeat that process until all the liquid has been strained. 5. I drink mine plain, but if you want to add some flavor/sweetness, you can add a little vanilla extract and/or some agave nectar or maple syrup. Now that I’ve tasted it, I think I really do like the homemade stuff better. I am going to play around with amounts of almonds and water and flavorings a little in the future, but as first batches go I’m pretty happy. Bear in mind, the home made stuff will only be good for 3-4 days, but since I’m doing this in smaller batches and “as needed,” that’s actually perfect for me. And that, my friends, is how you milk an almond. Enjoy! P.S. You can throw out the leftover almond meal, or hang onto it to add into baked goods or smoothies. I hung onto mine. Well, I didn’t realize how easy it was to milk an almond. Guess I won’t buy the store bought stuff anymore. And I love how you write too! Wow, I never realized making almond milk was so easy! I would definitely like to try making it sometime. Give it a shot! The end result is definitely more “almondy” than the store bought stuff. If you don’t like that big almond flavor, I’m sure a little vanilla would help round it out a bit. Nice! Would blanched almonds work better? I haven’t seen a recipe that calls for them vs. just raw almonds, so I’m not sure. I don’t think it makes a difference because you strain all the solids out anyway. Do let us know what you do with that almond meal once you decide!! 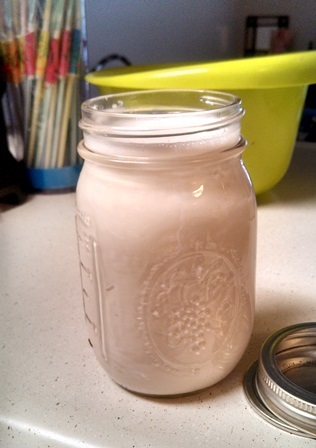 I’ll bookmark this…I’ve never made my own almond milk!